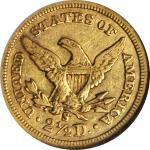 Lot:3014 1860-S Liberty Head Quarter Eagle. AU-53 (NGC). 1860-S Liberty Head Quarter Eagle. AU-53 (NGC).Pale yellow gold with generous luster remaining on both sides. The reverse is somewhat softer in definition that the obverse due to the strike. Neither side exhibits any serious marks other than a few light hairlines. Pleasing and flashier than often seen at this grade level.